Just when Azalea should feel that everything is before her—beautiful gowns, dashing suitors, balls filled with dancing—it’s taken away. All of it. And Azalea is trapped. The Keeper understands. He’s trapped, too, held for centuries within the walls of the palace. So he extends an invitation. This is not the first retelling of “The Twelve Dancing Princesses” that I’ve come across, but it might be my favorite. Mourning the loss of their mother and distraught by the cold shoulder shown by their father, the king, twelve sisters find solace in a magical realm. Many of the retellings feel like fairy tales, one-dimensional, lacking depth. But Dixon’s retelling has a heart that took me by surprise. The story was really about family. And there is a LOT of family when you have eleven siblings. 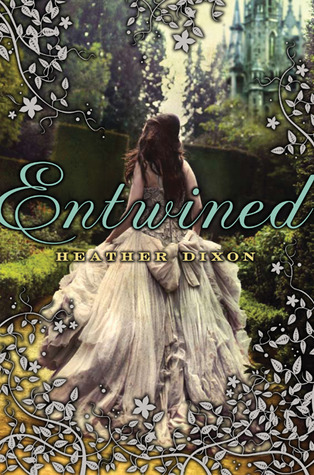 Entwined is a story about hope, forgiveness, and healing held together by this oddly supernatural evil. Azalea is a strong female character at the core of the book. Despite leading her sisters to the wicked Keeper and harboring a bit of a temper, she understands sacrifice and elevates family above all else.